Do you have a special occasion to celebrate? 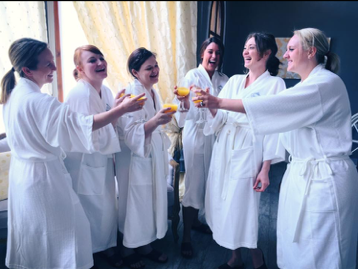 Whatever the event, Spa 211 can customize the experience to your needs. Intimate gatherings, parties, special events and group get-togethers are possible at Spa 211. For information about group reservations, please call 580.371. 6212 or email us. Have the Spa to yourself! We can customize an after-hours evening for your group of six or more guests. Build a unique visit with a package of three Spa 211 experiences. Living and being well isn’t about luxury or special occasions. Wellness is about being the best version of you. A deeply satisfying massage, a reinvigorating facial scrub, or a perfect pedicure is an act of self-love. It isn't a treat or one-time indulgence – it's an investment in you. Make wellness apart of your life with treatments that benefit your body and soul, from Spa 211.